Invisalign: Even the name sounds sleek! It promises teeth straightening without bulky metal brackets. Invisalign braces are even less noticeable than clear brackets that require metal wires. There was a time when silver metal, “railroad track” braces were your only option if you wanted to get crooked or uneven teeth straightened. But orthodontic options have advanced considerably. 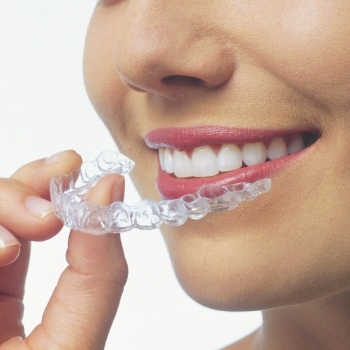 One of the most popular orthodontic tools are Invisalign’s clear plastic aligners. They’re made of clear, soft plastic which is relatively comfortable to wear. They don’t irritate the inside of your mouth like metal hardware often did. No wax is needed to cushion your mouth from metal braces, either. Invisaligns can be worn for just about any activity including sports. Another benefit is that you can remove the aligners while you eat, which is so much more convenient than getting food stuck in braces and having to deal with that. If all of that isn’t enough, Invisalign typically takes just 12 to 18 months to complete teeth straightening. That’s compared with twice the amount of time with old-style braces. All of these factors make Invisalign a great choice for many of our patients. Curious about how they work? Invisalign looks a lot like the trays you might use to whiten your teeth. They’re custom made for each patient to properly move teeth to the recommended position. Every couple of weeks, you’ll place a new and slightly different set of aligners. If you’d like to know if this technique is right for you, call our office at 319-373-5082 and schedule a consultation with Dr. McLaughlin. We are currently accepting new patients from Cedar Rapids and all surrounding Iowa communities.